The warning message says that the apk index is untrusted. This means that the pubkey is missing in the initramfs. You need to copy the key (~/.abuild/*.pub) to /etc/apk/keys/ and rebuild the iso. > > prompt. What should I do to create proper ISO image? 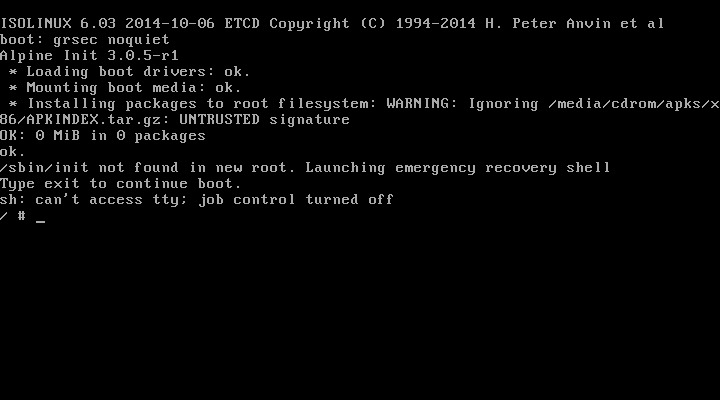 > > > <screenshot with error message: "/sbin/init not found in new root. In reply to: Matija Papec: "Re: [alpine-user] Makig a custom ISO image"